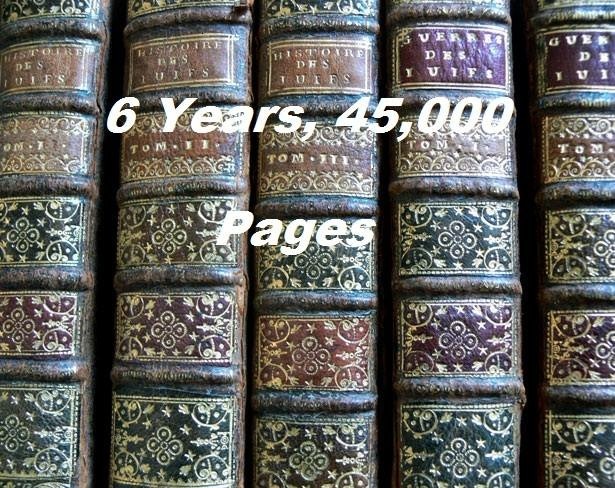 With a whole week to spare, I finished The Diary of Samuel Pepys, all 2711 pages of it! (for a point of reference, that's about 3 1/2 Harry Potter and the Order of the Phoenix's or Breaking Dawn's) One book down, ninety-nine to go! I was a little sad to finish it, I must admit. After reading his daily thoughts and musings for nine years of his life, I really felt like I knew him in some way. This sadness was compounded by the fact that he stopped writing in the diary with much reluctance at the age of thirty six because of his failing eyesight. As far as my views on the entire piece, I'm so glad I read it. From now on, whenever I read or hear about something during this time period, I will forever think of Samuel Pepys and the world in which he lived. I was particularly struck by the commonality that I found in it, how even though the world we live in is dramatically different in many ways, there is so much similarity both in things that are human nature and even in things that are culturally constructed. Perhaps that sense of universality is what makes this book so timeless. For one final Pepysian vocabulary word, I have "legerdemain" which means, "skillful use of one's hands when performing conjuring tricks." (definition from the New Oxford American Dictionary). The last two quotes of Pepys's that I have for you both relate to his appreciation of art, which, for him, is very much an emotional love, rather than an intellectual appreciation. In the first he goes to a play, as he often does, and is struck by the music he hears. "But that which did please me beyond any thing in, the whole world was the wind-musique when the angel comes down, which is so sweet that it ravished me, and indeed, in a word, did wrap up my soul so that it made me really sick, just as I have formerly been when in love with my wife; that neither then, nor all the evening going home, and at home, I was able to think of any thing, but remained all night transported, so as I could not believe that any musick hath that real command over the soul of a man as this did upon me: and makes me resolve to practice wind-musique, and to make my wife do the like." This quote reminded me very much of one from Shakespeare's Much Ado About Nothing in which Benedick says of music: "Now, divine air! now is his soul ravished! Is it not strange that sheeps' guts should hale souls out of men's bodies?" "But by accident he did direct us to a painter that was then in the house with him, a Dutchman, newly come over, one Evarelst, who took us to his lodging close by, and did shew us a little flower-pot of his doing, the finest thing that ever, I think, I saw in my life; the drops of dew hanging on the leaves, so as I was forced, again and again, to put my finger to it, to feel whether my eyes were deceived or no." 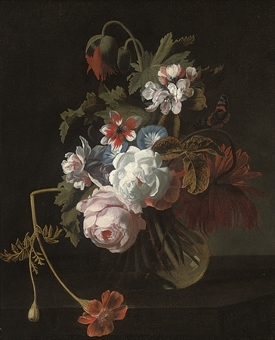 According to some research I did, the painter he mentions is actually Simon Pietersz Verelst, a Dutch still-life painter famous for his paintings of flowers (Pepys is always terrible at spelling names). Although I don't think there is any way to know which painting Pepys saw, here is a picture of one of Verelst's paintings that perhaps resembles the one Pepys described. So that concludes Pepys! Up next: Pride and Prejudice! Nicely done! Hope you enjoy Pride and Prejudice! How are you deciding which book to read next? Thanks! I'm already enjoying it! I am not reading the books in any particular order, so for now it's just a matter of what I feel like reading next! After you are finished with your quest, I would recommend reading Claire Tomalin's excellent biography "Samuel Pepys: The Unequalled Self". I had to go back and re-read the Diary because the biography provided so much deep background to his life. I found the Diary even better with this insight. Thanks for the recommendation! I'll definetely have to check that out.